Overwhelming! 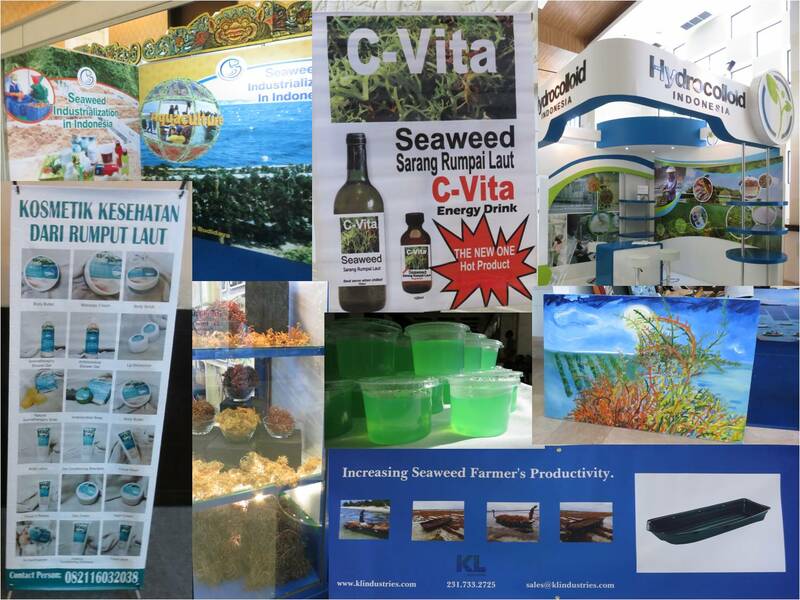 That’s the word that remains after you have entered the Bali Nusa Dua Conference Center and see all exhibitors showing 101 use of seaweed. A phletora of products involving seaweed. It is quite often I get to inform people that algae is actually a common ingredient in many of the products we use daily, such as shampoo, soap and toothpaste. But there are more represented here than I thought possible! Many companies producing various substances from seaweed are represented, followed by those that further refines the extracted elements to create all manner of products. Most exciting is of course the abundance of food with algae, both in pure form, such as seaweed snacks and jelly in different shapes (and colors!) made of agar agar extracted from seaweed. And it’s a tasting of everything! This is not a conference you go away hungry from. Possibly you have set the stage for diabetes, though. 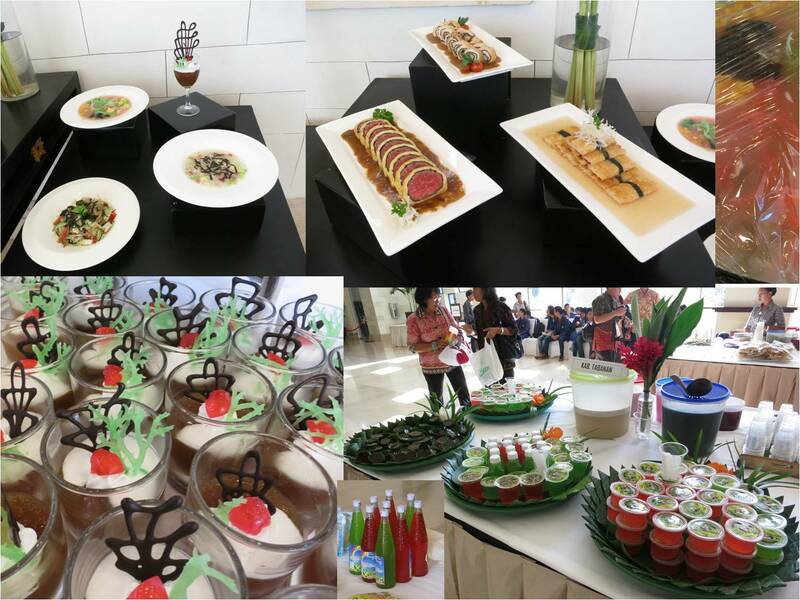 There is no end to what gastronomy can do with seaweed! We will post pictures, both in blog posts and in the gallery, so that you who are following the blog may take part of the diversity. The opening ceremony of the conference began with a traditional Balinese dance and the Indonesian national anthem, followed by a number of prominent dignitaries, who in five minutes per person explained that they were pleased and proud that the conference was held here in Bali and that algae are an important part of the region’s economy and important global product. At least I think that’s what was said, when many spoke in Indonesian. But the audience seemed pleased and it was much applause. In the audience were amongst others the Fisheries Ministers from Tanzania and Morocco and Bali’s trade and industry minister. There are a total of 38 countries participating in the symposium, most from the so-called Coral Triangle (Indonesia, Sulawesi and the Philippines) but Europe is well represented. The country with the highest number of presentations is Malaysia (57), followed by Indonesia (47), with France (31: Not bad.) in third place. The flags of all participating nations. Aquaculture is not without problems, as most of you probably already know. One example are fish farms, which releases nitrogen and other substances in the water around it and on the bottom under the cages. To reduce the negative effects one can grow several different species together, where the waste of one becomes the other’s nutrients. Here, seaweed is a major factor. Alejandro H. Buschmann began by summarizing the need for more research on how seaweed work in co-cultures, if they can transfer infections between each other or to animals, and that more research is needed on integrated culture of species from different trophic levels. 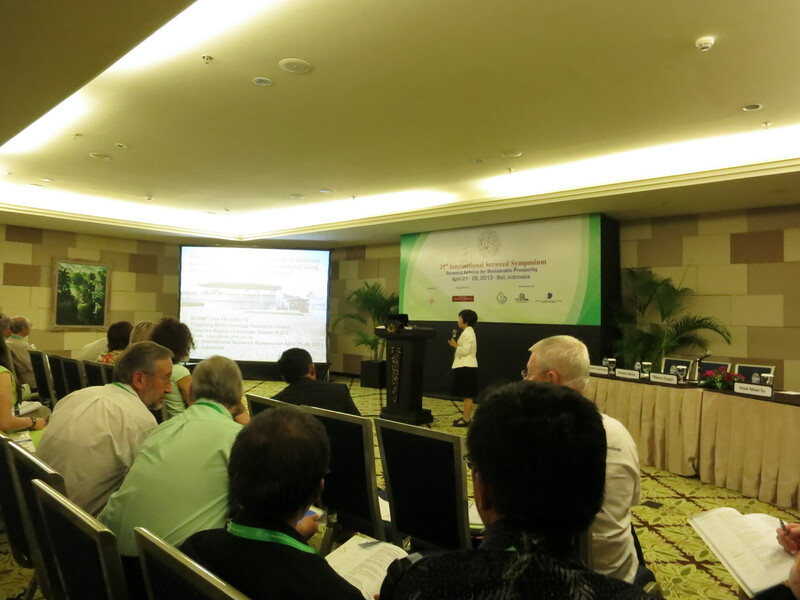 Helena Abreu presented the IMTA studies conducted in Europe, which is far behind Asia in this aspect, focusing on seaweed cultivation. For example, they tried to reduce the negative environmental impacts of land-based fish farms in Norway and France by growing Ulva spp (sea lettuce) as nitrogen cleaner. The important thing is to get a seaweed product that there is a market for, either as food, fertilizer or to extract different substances from. Interest in IMTA growing in Europe, especially since there is a need for greater production of aquaculture animals, and therefore a need for more waste treatment, but also the need for a diversity of organisms to grow, in order to have safer and more sustainable systems. The interest in seaweed is huge in Europe, not only as food but also as an ingredient in skin products and for the extraction of biofuel. With the increased need, it is important to assess that farming and harvesting are done in a sustainable way, so that one does not get a boom-and-bust problem, taking out too much and causing the system to collaps. In addition to the biological and technological challenges, where fish farmers should learn to cultivate a new species, there are also some regulatory barriers that need to be resolved. Today, it is mainly Norway, Portugal, France, Ireland and Denmark that grow seaweed on a large scale in Europe. They grow mainly kelp species, mostly Saccharina latissima which can be found on our Swedish west coast, too. In Denmark, there is co-farming of kelp with trout and clams or only kelp and mussels. The kelp is grown on long ropes that hang freely in the water, looking a bit like a clothesline. In Brittany, France, oysters and algae are farmed together. Here, it is the green alga Ulva (Sea lettuce) that is growing on oyster cages. In Portugal (using the water outside Senegal) they are cultivating kelp with sole (the flat fish), something that is also tried on the Canary Islands. In Ireland, they grow the delicious brown alga Alaria esculenta together with salmon. In order to extract as much as possible from farmed algae there is a project to create a macroalgae biorefinery. This is collaboration between several European countries, hoping to launch a thriving seaweed culture industry also in Europe, once the current financial crisis has been resolved. Agar is extracted from the cell walls of agar producing seaweed such as Gracillaria sp. Depending on whether the seaweed are grown in large tanks on land, in larger ponds or in the ocean, there is a variation in growth rate, growth of fouling algae, susceptibility to various diseases and the chemical content of the algae. In Malaysia, Dr Su has assessed the pros and cons associated with each method, and also tried other methods. This included the use of floating net cages, which are often used in fish farming. They also let spores settle on fixed bottom nets and ropes, which gave a greater return on the ropes over the nets. Problems connected with ropes and nets were primarily that many other species also liked to grow there (fouling). Dr Su from Malaysia explains her findings in culture methods. To evaluate which method was the best, not only in quantity algae produced per unit of time, they also analyzed the finished agar powder to compare the quality of the product. They found that from some areas the product contained excessive levels of lead, too high to be sold as food. The water chemistry and pollution history of an area are important to take into account when determining whether to start growing seaweed for consumption. The main problems, though, are still grazing and unwanted growth of other species (fouling). Norwegian salmon farming is growing rapidly. Up in Trondheim, where there are plenty of salmon farms, they have grown Saccharina latissima outside the salmon pens. The seaweed are seeded on long ropes in the lab, then hung out in the water. Saccharina latissima is seeded in August and will not grow much during the dark winter. But when the light comes back in February to March it starts growing and keep growing strongly until June, where it reaches its maximum. This is harvest time. If you leave it any longer it begins to deteriorate and get more fouled by animals and other algae. Also, the highest concentrations of carbohydrates (alginate, laminated aria and mannitol) are in June. Saccharina latissima grows best at 5 meters depth, where there is just the right amount of light, neither too much nor too little. Saccharina latissima grown in a salmon farm grew a full 50% more! Norway is ideally situated in order to develop a profitable seaweed faming industry and develop a more integrated aquaculture. A study from the UK compared various plastic materials in order to find out what kind of surface and chemical composition that is best for seeding and growth of two different species of kelp (Laminaria digitata and Saccharina latissima). They tried 12 (!) different plastics with different chemical properties, including a plastic consisting of phenol-formaldehyde resin (super toxic!) to see how sensitive the small spores are (kelp, unlike bladderwrack, has spores). The competition between the two kelp species were checked after seeding, after 5 weeks, after being moved outdoors and after 3 months. Saccharina latissima is more tolerant to the chemical than Laminaria digitata and grew better on most plastics (few to none survived on the super toxic). It seems that plastic is not the best substrate to cultivate Laminaria digitata, but most plastics work well for growing Saccharina latissima. If you want to grow both species, the best plastics are PE, PP and PVC, apparently. 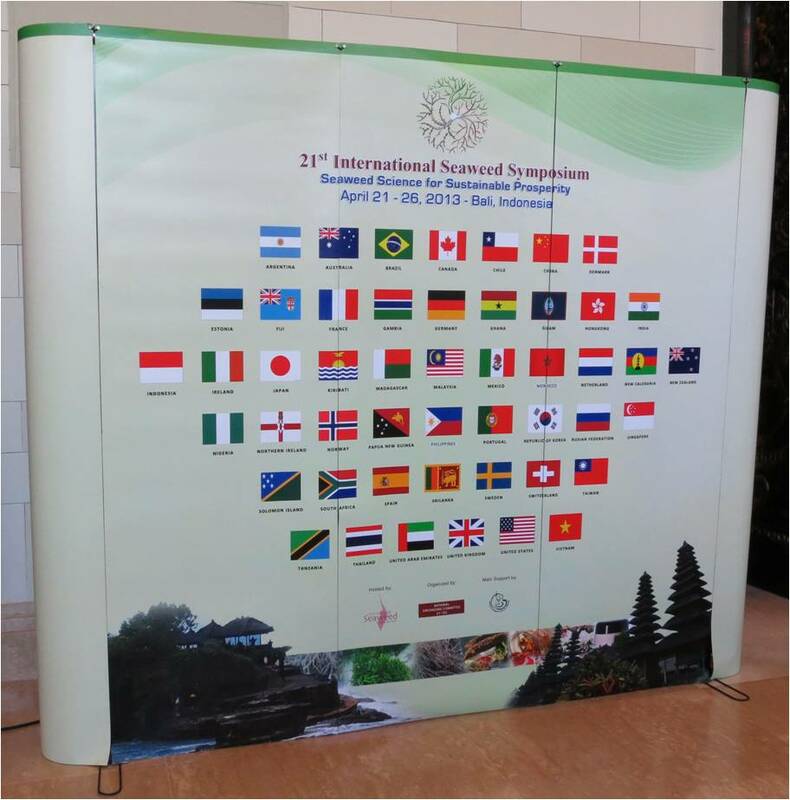 This entry was posted in News and tagged 21st International Seaweed Symposium, algae, Bali, conference, macroalgae, research, seaweed. Bookmark the permalink.